Melbourne: India vice-captain Ajinkya Rahane on Monday confidently said that he would hit ton at the Boxing Day Test. "It (century) will definitely come. I'm really sure it will come in this Test match with the way I am batting since Adelaide," Rahane said. "I think I will get two hundreds but it will be important for me not to think about it and continue the way I am batting. If I can read the situation well and bat accordingly it will be better for the team. Personal milestones can come later," he added. India middle-order batsman Ajinkya Rahane hasn't scored a century in over 16 months, but feels like he's on the verge of breaking the drought. India's vice-captain has good reason for this confidence. With a fifty each in the Adelaide and Perth Tests, Rahane is the third-highest run-getter in the series with 164 runs at 41.00. Rahane has been in decent form of late, but just hasn't been able to convert fifties into centuries. His last century came in an overseas Test against Sri Lanka in early August. In his last seven Tests, he has scored a total of five half-centuries, including a match-winning contribution of 81 in Nottingham against England. His second-highest score in that period is the 80 he scored against the Windies recently. Yet, the three-figure mark has eluded the batsman, and he's confident he will turn that around in the Boxing Day Test ? the third of the four-match series. He also emphasised that the batsmen definitely need to step up as runs have been hard to score on both sides during the series. "The batsmen definitely need to step up," said Rahane. "When we discuss the batting unit, that point is very important. Especially when we are abroad, the bowlers have been taking 20 wickets since South Africa, so if the batsmen help the bowlers the results will be favouring us." Rahane said. After winning the Adelaide game, India were dished a crushing 146-run defeat in Perth. Rahane feels the onus is on India's batsmen to step up and support the bowlers, who have done a remarkable job. 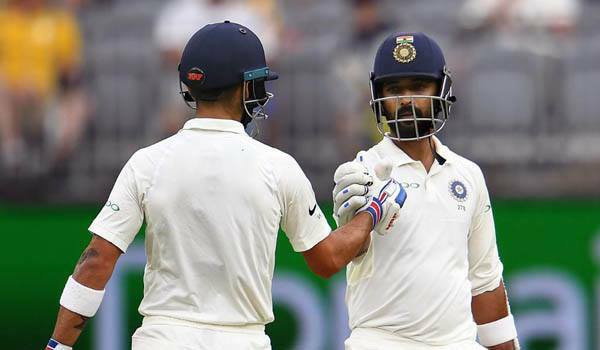 With a lengthy break between the Perth game, which finished on December 18 and the next one, Rahane feels India have had time to get fully recharged to enjoy a 'fresh start'. "We will now look at it as a two-Test series going ahead," said the 30-year-old. ?We got a break after the first two Tests, which was very important because sometimes the intensity of the Test match is too much.